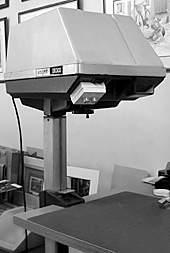 I’m a great fan of Artograph and I’ve been using my Artograph DB300 for over 25 years. Alex Dow of Artograph Customer Services contacted me unexpectedly, as a result of one of my Artograph posts, and has generously posted links to my website, “Drawing from Line to Life” book, and my Starving Artists website on Artograph’s Facebook page. Thanks Alex! It also reminded me that I have a Post-It note (one of many!) stuck to my monitor as a reminder to pass on the news about replacement bulbs. My DB300 use two 150 watt photofloods in screw-fitting holders. Although my bulbs very rarely fail (more about this later) one inevitably did and, of course, at just the wrong time. I Googled for a replacement only to find the screw-fitting version is no longer available. So I had to either find an alternative or source ceramic bayonet sockets to fit the available bulbs. I ordered a couple too, and they work! They’re halogen, so a little cheaper to run, indistinguishable from the old E/51’s light output, and – I’m getting ahead of myself here – they’re fully dimmable. I fitted my Artograph with twin dimmers because sometimes, if my source entirely covers the 10″ x 8″ copyboard, I need to reduce glare on one or even both sides. That glare can severely reduce visibility of crucial detail. For a while I would unscrew the bulb on the offending side, but that reduced the light output by a full 50%. The solution? I altered my DB300’s wring, and moved the on/off switch to make way for a pair of domestic lighting dimmers. This allows me to control the lighting on one or both sides simultaneously. As a bonus, I always run both bulbs at 90% power – the reduction in light is barely noticeable and it greatly increases the lifespan of the bulbs. I’m also pleased to report that the dimmers work with the new halogen bulbs! 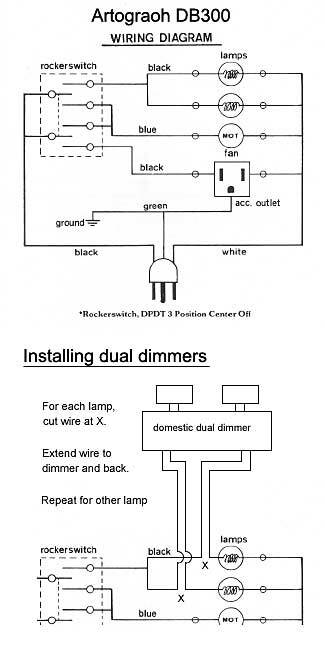 I knew halogen bulbs are dimmable but I believed they needed dedicated dimmers – not so! If you make the modification, encounter any problems, or have installed any other interesting modification, I’d be delighted to hear from you. Thanks again Alex. Thanks Lesley for finding the bulb source for us. I also use the DB300. Great projector. I use the Sylvania 212 for a replacement bulb. Seems to be available everywhere and cheap.